As seen in Sunday's The New York Times Arts & Leisure! 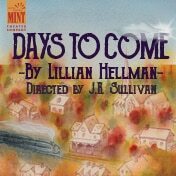 "It's the sort of play the Mint Theater Company lives to revive Off-Broadway"
Mint Theater (Jonathan Bank, Producing Artistic Director) will present a rare revival of Days to Come by Lillian Hellman, “one of the most important playwrights of the American theater” (New York Times). Performances will begin this Thursday, August 2nd, and continue through September 30th at Theatre Row (410 West 42nd Street). Opening Night is set for August 26th. Mint Theater continues its commitment to present undiscovered gems from women playwrights. Nearly a third of the plays produced by Mint have been by women, rom Pulitzer-Prize winning plays by Zona Gal and Susan Glaspell, to ork by Cicely Hamilton, itha Sowerb, Hazel Ellis, Maurine Dallas Watkins, Rose Franken and Dawn Powell. In 2006, New York audiences were re-introduced to Rachel Crothers — once the toast of Broadway — with the highly praised production of Susan and God, followed by n qually acclaimed production of Crothers’s A Little Journey in 2011. Teresa Deevy had all but slipped from memory, even in her native Ireland — until the Mint came to her rescue with a our-productio, two-publicatio effort to resurrect her work and reputation, starting with Wife to James Whelan in 2010, continuing with Temporal Powers in 2011, atie Roche in 201 and The Suitcase Under the Bedin 201. ow, add Lillian Hellman to that roster! Audiences had no chance to appreciate Days to Come when it premiered on Broadway in 1936; it closed after only a week. Hellman blamed herself for the play’s failure. “I wanted to say too much,” she wrote in a preface to the published play in 1942—while admitting that her director was confused and her cast inadequate. “On the opening night the actors moved as figures in the dream of a frightened child. It was my fault, I suppose, that it happened.” Nevertheless, “I stand firmly on the side of Days to Come.” In 1942, Hellman could afford to take responsibility for the play’s failure; she had enjoyed much success in the days after Days to Come (with both The Little Foxes and Watch on the Rhine). But Hellman’s play is better than she would admit. Days to Come was revived only once in New York, in 1978, by the WPA Theatre. In reviewing that production for The Nation, Harold Clurman wrote that that “our knowledge of what Hellman would subsequently write reveals that Days to Come is not mainly concerned with the industrial warfare which is the ‘stuff’ of her story for the first two acts. Hellman’s real preoccupation is “the lack of genuine values of mind or spirit” of her principle characters, the factory-owning Rodmans. More than a neglected curiosity by one of America’s greatest playwrights, Days to Come is subtle, complex and vital drama: “Very much worth seeing,” indeed. J.R. Sullivan directs a cast that features Mary Bacon (Mint Theater: Women Without Men, Madras House; Broadway: Dear Evan Hansen, Rock 'n' Roll, Arcadia; Off-Broadway: The Tribute Artist, Giant, Harrison, TX: Three Plays by Horton Foote); Janie Brookshire (Mint Theater: Wife to James Whelanand the title role in Mary Broome; other Off-Bway: The Mound Builders, Man and Superman, The Misanthrope), Larry Bull (Bway: The Coast of Utopia; Off-Bway: The Traveling Lady, Rocket to the Moon), Chris Henry Coffey(Bway: Bronx Bombers; Off-Bway: Water By The Spoonful, Fountainhead, Frank's Home), Dan Daily (Bway: The Tenth Man; Off-Bway: A Moon for the Misbegotten, The Subject Was Roses, Widowers' Houses, The Merry Wives of Windsor, The Scarlet Letter), Ted Deasy (Bway: The 39 Steps; eight seasons at Oregon Shakespeare), Roderick Hill (Mint Theater: Return of the Prodigal, Mary Broome; Bway: Butley, Lestat; other Off-Bway: Stalking the Bogeyman, Unnatural Acts, The Irish Curse, Cymbeline), Betsy Hogg (Bway:Peter and the Starcatcher, Fiddler on the Roof, The Crucible; Off-Bway: The Prime of Miss Jean Brodie), Kim Martin-Cotten (Broadway: Time and the Conways, The Little Foxes, The Merchant of Venice; Drama Desk Award nomination: A Moon for the Misbegotten), Geoffrey Allen Murphy (Bway:The Nance, War Horse), and Evan Zes (Off-Bway: Incident at Vichy, The Freedom of the City, White Woman Street, Around the World in 80 Days, American Dreams: Lost and Found; Rent Control - writer and performer). Days to Come will have scenic design by Harry Feiner; costume design by Andrea Varga; lighting design by Christian DeAngelis; sound design by Jane Shaw; and prop design by Joshua Yocom. Casting is by Stephanie Klapper, CSA. Rod Kinter will serve as Fight Director. In the 1960s and ‘70s, Hellman’s firebrand legend continued to grow, along with her profile as a cultural lightning rod. She published a bestselling series of truth-seeking, but fact-blurring, memoirs, including An Unfinished Woman(1969) and Pentimento (1973). These books inspired the 1977 film Julia,starring Fonda as Hellman—and fueled accusations of being a “dishonest writer” from Mary McCarthy, who Hellman sued in 1980 in a much-publicized defamation lawsuit. She died in Martha’s Vineyard on June 30 1984, memorialized for her unsentimental moral vision and incisive characterizations, often centered around “difficult women.” In the twenty-first century, Hellman’s plays have inspired many revivals and celebrations, highlighting the playwright’s complexities and “miraculous contradictions.” She is also the namesake of the Lilly Awards, honoring women in theatre. Performances for Days to Come will be Tuesday through Saturday evenings at 7:30pm with matinees Saturday & Sunday at 2pm. No performance: Saturday September 8th at 2:00; Tuesday September 18th at 7:30. Special added Matinees at 2pm on Wednesday September 5th and Thursday September 20th. All performances will take place at Theater Row (410 West 42nd Streetbetween 9th and Dyer Avenues). Tickets for Days to Come will be $65.00 (including $2.25 theater restoration fee) and can be purchased online at Telecharge.com, by phone at 212-239-6200 or in person at the Theatre Row Box Office. "Thank heaven for the unwavering commitment of Jonathan Bank, the theatrical archaeologist whose Mint Theater Company unearths long-forgotten plays and imbues them with new life,” declared The New York Times in response to a recent Mint production. Mint was awarded an OBIE for “combining the excitement of discovery with the richness of tradition” and a special Drama Desk Award for “unearthing, presenting and preserving forgotten plays of merit.” Ben Brantley in The New York Times Arts & Leisurehailed the Mint as the “resurrectionist extraordinaire of forgotten plays." For more information, including photos and videos of Mint productions, visitminttheater.org.